WASHINGTON — California Rep. Eric Swalwell will become the latest Democrat to enter the 2020 presidential race Monday evening in an appearance on "The Late Show with Stephen Colbert." "It's official," he adds to cheers from the audience. "Boy did it feel good to say that." "The Late Show" released the clip on Twitter a few hours before the show airs. 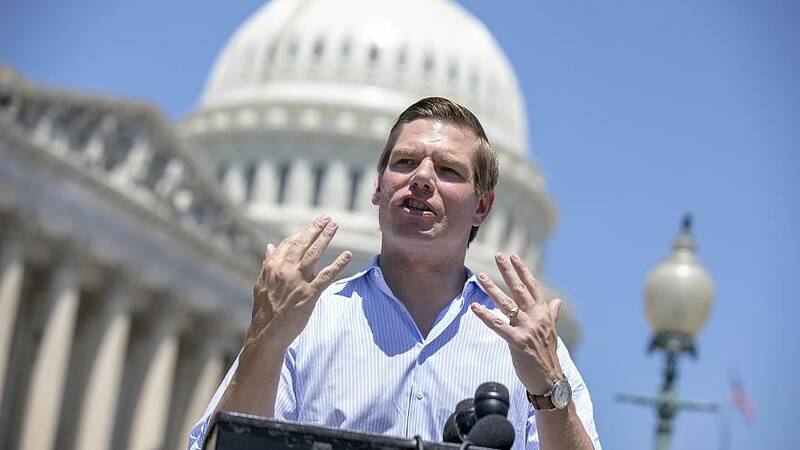 Swalwell has also made gun control a focus of his career and is due to hold a town hall Tuesday in Parkland, Florida, the site of the 2018 mass shooting at Marjory Stoneman Douglas High School. "I believe I'm a generational candidate who can bring inventiveness and optimism to a city, a place that's very pessimistic and I have experience," Swalwell continued. "In the last seven years particularly the last few on Intelligence Committee our democracy has been on the ropes. I know who our threats are from the outside. I know who was attacking the rule of law on the inside and I'll stand firmly and defend it."